There isn't a bar in all of Ohio, let alone Cleveland, that Cardale Jones can't (legally) have a beer bought for him right now (he's 22 after all.) The last three games in his football career and three months in his life have been like nothing before (and in all reality, nothing in the future) for young Mr. Jones. And he's about to make a pretty big decision at 3PM 4PM today. I've been saying since after the Alabama game, and especially now after the Oregon win to give the Buckeyes the Championship, if Cardale goes to the NFL (which is likely what this announcement is), it's the right move. He's got the physical skills--the size, the arm, even the legs of a premier NFL QB in the mold of Ben Roethlisberger. He seems to have the game skills--dude didn't look rattled at all. Two "stupid" fumbles as he said, but none of the skittishness of, say, the Browns' rookie QB. His demeanor is amazing. 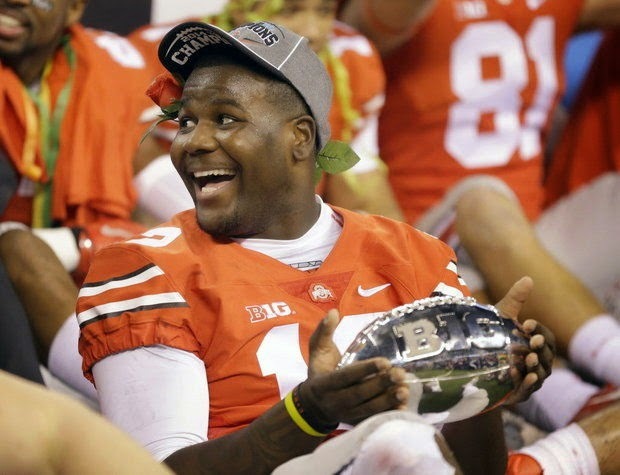 Mel Kiper was on television Tuesday morning saying that Cardale could be the #1 overall pick next year. If that's true, I don't see every NFL team passing on him for more than two rounds. And I certainly can see some combine work where he shoots up the draft board. The risks--and not just injury--are pretty big. There is no guarantee that he can beat out JT Barrett or Braxton Miller, should they both return, for the starting position next year. There's no possible way he has bigger wins than the three he just had. Maybe the same--but the risk is a shaky showing against someone like Iowa or Rutgers. If the NFL is your path--good luck, Cardale. It's been a fun but all too brief ride. It might take a couple years, but in the right place, I think you'll be fine. Plus, looking forward to more of the amazing social media you'll put out there. Like this, probably the best tweet in Ohio State history.